Early development of Platynereis massiliensis was studied in serial sections of fixed embryos and in living or fixed embryos whose nuclei had been made visible with a fluorescent label. The unfertilized egg is an ellipsoid with three axes of differing length. The longest axis corresponds to the dorsoventral axis of the developing embryo. Egg volume is ten times that in the sibling species, P. dumerilii, mainly due to increased yolk content. The timing and spatial pattern of cleavage were observed from first cleavage to the 62-cell stage. Volumes of the blastomeres, their nuclei, their yolk-free cytoplasm and their yolk were determined from serial sections up to the 29-cell stage. In the P. massiliensis embryo, cell cycles are on average 3.7 times longer than in P. dumerilii; volume proportions among the blastomeres also differ and the macromeres containing the bulk of yolk are particularly large, but otherwise the cleavage patterns, differential segregation of yolk and yolk-free cytoplasm, and the histogenetic fates of the blastomeres are the same as in P. dumerilii. 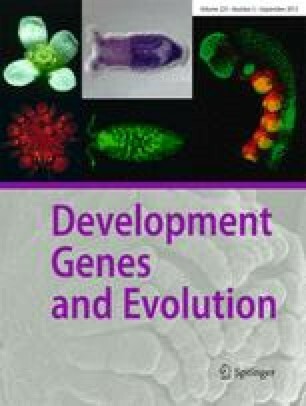 This equivalence of cell lineage and of cytoplasmic segregation mechanisms in both species, maintained in spite of the different appearance of the embryos, suggests functional importance of and selective constraint on these developmental features. The relatively accelerated divisions of the 2d cell line in P. massiliensis may be interpreted as the precocious development of cell lines which give rise to adult structures. Several structures, obviously functional in developing P. dumerilii, have lost their function in P. massiliensis: the egg contains few cortical granules, giving rise to only a moderate egg jelly layer in the zygote; prototroch cells develop cilia, but the heavy embryo is unable to swim; the larva develops three pairs of parapodia but, unlike the corresponding stage in P. dumerilii, is not capable of coordinate locomotion. This loss of motility is related to the brooding habit of the species developing inside the parental tube and is explained as the result of a switch from pelagic to benthic, protected reproduction in P. massiliensis.